Fall is a good time to remove the dangerous trees that are in your lot. These trees are sometimes difficult to spot, but these trees are called 'hazardous' or 'dangerous' trees because they can do damage to houses, garages, cars, and anything surrounding them. Proper tree removal equipment is essential to successfully (and safely) remove dangerous trees, and Pioneer Tree Service will bring the needed equipment to complete the tree removal job. Hazardous trees are often at a high risk of falling down, having often been damaged and injured in storms, or these are older trees that may be near the end of their life. 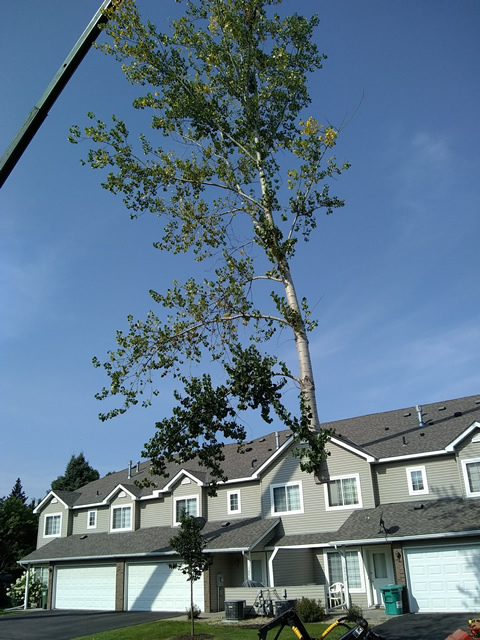 The tree experts at Pioneer Tree Service will evaluate the dangerous tree and implement the safest way to remove the tree. 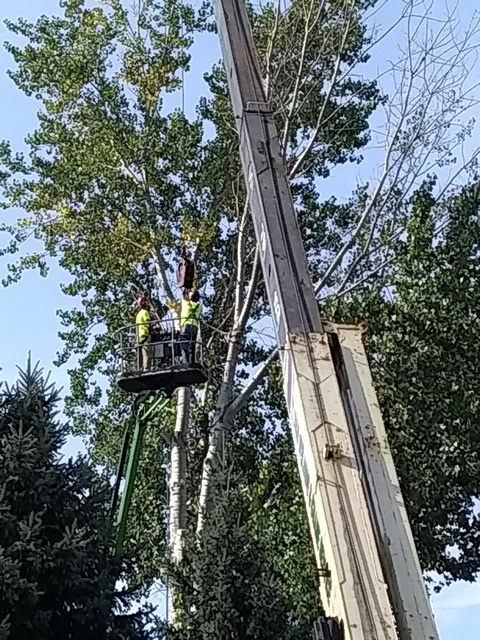 Pioneer Tree Service uses equipment such as an aerial lift and bucket to ensure that the tree is removed without damaging any nearby buildings, landscaped areas of your yard, and minimizing the damage to your lawn. 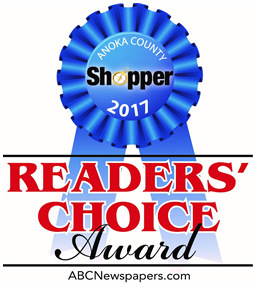 Pioneer Tree Service - experts in Dangerous Tree Removal. Proper equipment is important to minimize risk of damage to the home. 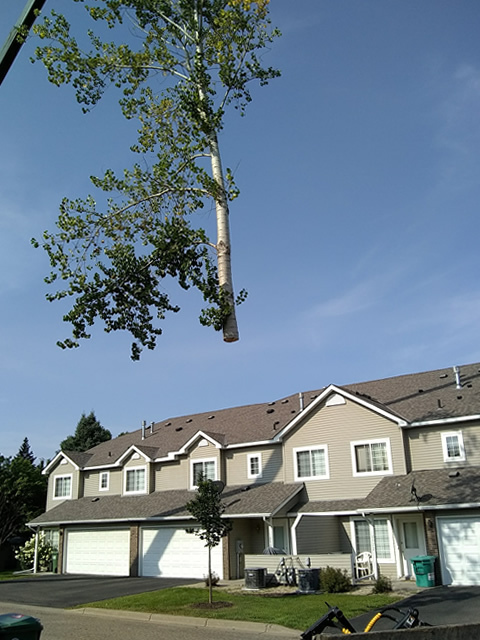 Schedule Your Dangerous Tree Removal Today! 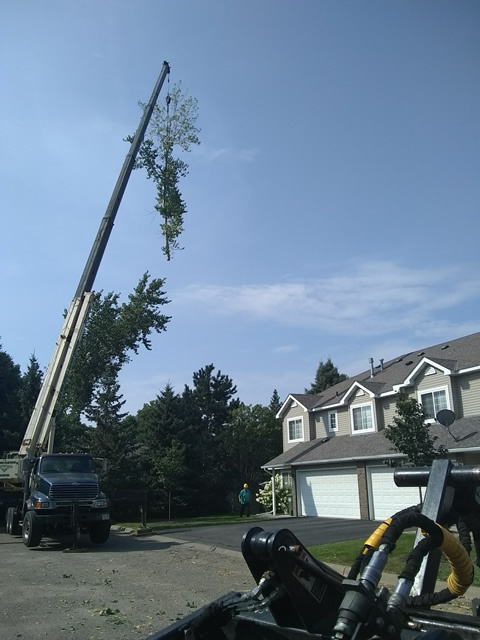 If you have a dangerous tree that needs to be safely removed, call the experts at Pioneer Tree Service at (763) 238-5254 or fill out the form on this page to schedule an appointment. Safely removing a dangerous tree by townhomes. Attention to detail - cleanup and removal after tree removal.